Many of us are anxiously awaiting the official launch of Podcasts in Play Music. While a few people have already been given an accidental early look, there are good reasons to be confident that the real launch will happen sometime in the next week and a half. It should come as no surprise that the latest update to the Play Music app happens to include a few fixes and features for podcast listeners. 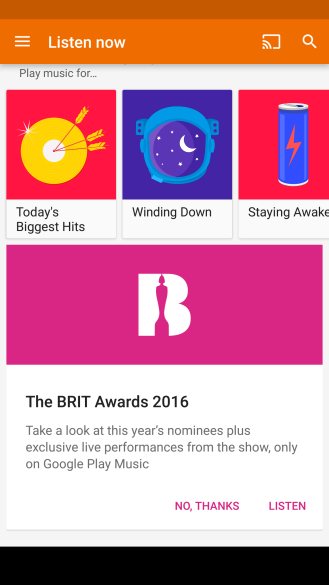 On top of that, Google is preparing for an exclusive deal with the BRIT Awards. For those that want to know about new features, it doesn't look like there's anything to talk about right now. Of course, for those rare few that got the early access to podcasts, that part of the teardown is probably like a What's New for you. Back in January, I noticed that the app looked light on features, and after a few users were surprised with podcast support before an official launch, it was confirmed that support in the app was still pretty barebones. But it's true that most podcast apps on the market offer quite a bit more functionality, particularly things like smart playlists and variable speed playback. Naturally, the expectation has been that more functionality would come to the app in time, and it looks like the first addition is going to be control over playback order. Sure, it looks really basic, but it's a fundamental feature for listening to podcasts. Most listeners prefer to catch up on long-running talk shows by starting at the beginning, but the opposite is true for news shows that lose their relevance after a day, a week, or maybe a month. It's award season, at least here in the US, and everybody is talking about the Oscar nominees. Our friends in the UK have another event going called the BRIT Awards, a music-focused event which has been compared to the Grammy Awards. Google regularly advertises events like these on the Play Store, at least when there's some content to sell, but every once in a while there's something more interesting to advertise. It looks like Google has struck a deal with the BRIT Awards to be the exclusive streaming music carrier for this year's live performances. The specifics haven't been released, but all of these performances should be available within a few days after the award ceremony, scheduled for February 24th. There is also a tribute to David Bowie planned for the event, which may also make it into the list. A few readers have started noticing the BRIT Awards promo showing up in the Listen Now screen, just about a day before the event. It looks like the promo is only showing up for those in the UK and possibly some surrounding areas, but it may appear in other regions, as well. Alternate Title: Play Music v6.4 Talks Exclusive Music Deal With BRIT Awards, Wouldn't It Be F'ed Up If This Was [US-Only]?